As I posted last week, several of my campaigns are at transition points. I discussed my love for these moments on The Gauntlet recently. With our 13th Age game on summer hiatus, we’re switched over to a short Dresden Files Accelerated campaign. 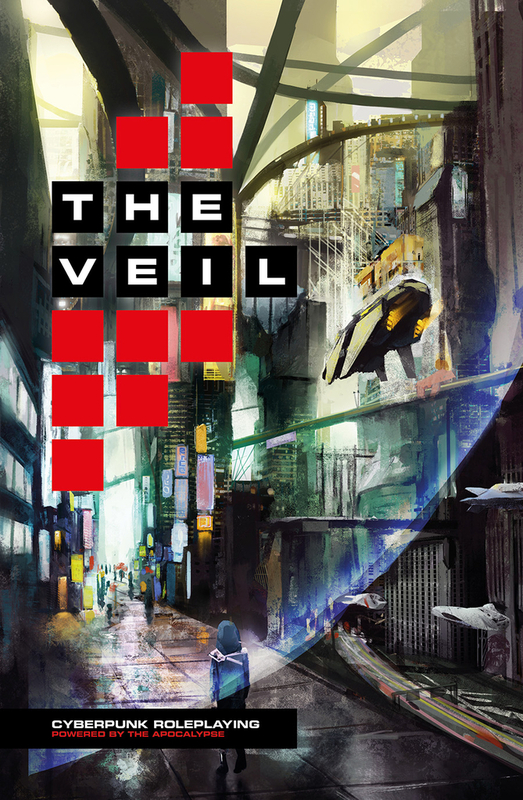 I’ve also started a mini-campaign of The Veil for Sherri, Kali, and my nephew David while he’s home for the summer. We started that Sunday, getting through character creation and several scenes. I didn’t go much further since I’d run Mutant Year Zero in the morning and played Apocalypse World in the afternoon. In the good (?) old days, I’d say “hey, I’m running X now.” Usually the group would go along; maybe we’d have some players switch out. But times have changed and our f2f player pool has tightened. What I run needs to appeal to everyone. I want collaboration and buy-in from those players. Once I figured that out, I tried putting together massive lists of pitches. Way too massive. I diluted the pool and common interests. The few times I did that we got a final result with shared light enthusiasm over something everyone dug. The Paradox of Plenty. Now I limit myself to 3-4 pitches at most. That gives me a pool I can invest energy in, time to explain each one, the ability to hand around materials, and few enough games that they’ll recall each when they vote. I present the games with a caveat. If any of them are a “Hard No,” I’ll pull them from consideration and add something else. I don’t want a game on offer that someone would quit rather than play (or play under duress). I also tell them we’ll check in every six or so sessions to see where we are and if we need to wrap. After explanations and questions everyone votes secretly, even me. I break any ties. 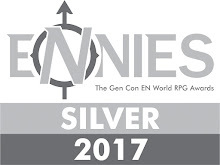 Last time Mutant: Year Zero won, but all three other contenders tied. I bring passed-over, but well-voted games for later consideration. That’s a diverse set. Originally I wanted Blades in the Dark in there, but since I didn’t have the hard copy yet, I subbed in Tianxia at the last minute. Godbound won by just two points. Then Coriolis & The Veil came in with a near tie, and finally Tianxia. That group generally prefers fantasy, so the final pick wasn’t a total surprise. 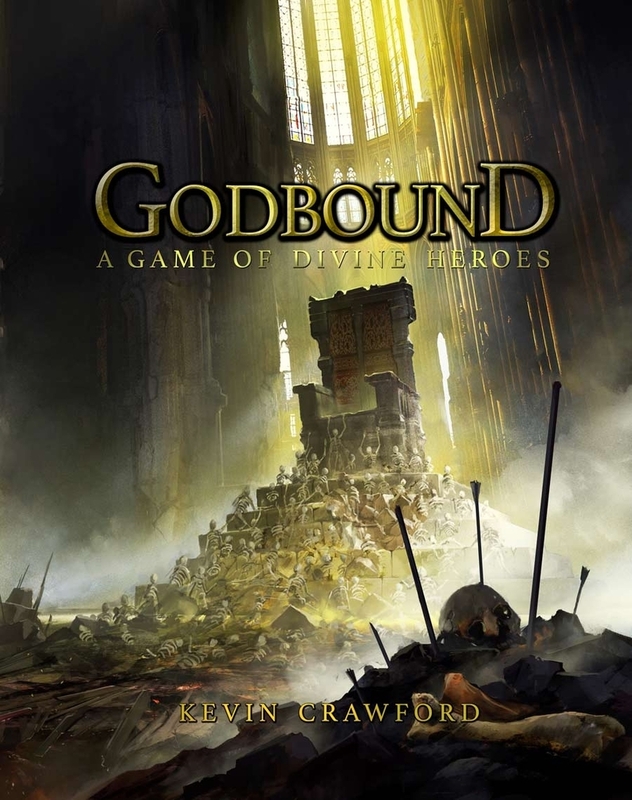 Godbound has both a premise and a setting. The former has the PCs gaining/ channeling/ receiving divine powers from dead gods. There’s been a centuries long conflict, leading to human sorcerers storming the gates of heaven with artificially constructed gods. That all blew up, leaving behind remnants and threats like The Night Roads. Godbound has an Exalted vibe. Players start with powers and can deal serious damage right out of the gate. They’re not gods per se, just potent. Godbound’s setting takes up a good chunk of the book. Crawford’s built a striking world, echoing some of his earlier fantasy work. It has distinct nations, lightly defined with problems and relations. Many have a strong Earth-culture parallel. They’ve released a couple of sourcebooks for the setting. While they’re solid, I’d rather build some things ourselves. Luckily Godbound supports that too. It has the designer’s trademark tables for generating plots and content. I expect I will combine that with a Microscope-like approach. I haven’t yet decided what level to begin at. I put together a blank fantasy map in Hexographer. I might have everyone add nations and name places. Alternately I might focus on building just a city. Then we could discover the rest of the world as we play, hex-crawl style. Our Wednesday group plays online. These five originally came together in the City of Heroes MMO. Several players I grew up with before they moved away. So far I’ve finished a 13th Age and a three part M&M 2e campaign with them, both fairly long. Our current Mutant & Masterminds 3rd edition campaign will probably wrap tonight with session 27. It’s a group that leans trad. Also there’s a lot of real world distractions during play. As a result I have to carefully consider multi-thread plots and mysteries. I’ve been running on this night for years, but I still haven’t developed the perfect style for them. I choose three games, all of them PbtA. I wanted to try something new, with different approach. A couple of the players have tried these games, so it isn’t entirely alien. I offered three games, two with a highly built in structure which I think the group will dig. The Sprawl won, but Blades in the Dark came a close second. Urban Shadows followed slightly behind. Each game had at least one first place pick and one last place pick in the voting. I’d regretted leaving out BitD after Sunday’s offer, despite not having the hardcover. I decided to offer it anyway, since I figured I’d have it soon (spoiler: still don’t have it as of this writing). Cyberpunk will be an interesting switch after fantasy and superhero. 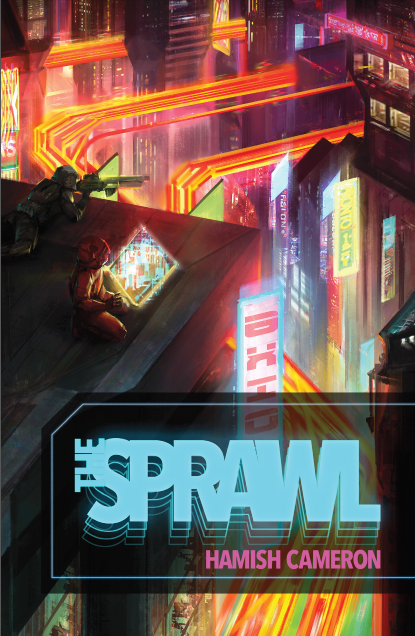 All three have excellent Roll20 sheets, an added bonus The Sprawl has an especially nice one. Some users have figured out how to build striking interactive Countdown clocks. I need to work those out. The Sprawl also a tight mission structure, more episodic than other games. That may lend itself to our game, with weird schedules in the summertime. The group also loves doing world-building so that’s a plus. The only downside I can see will be figuring out the netrunning rules. It’s the section I’m least comfortable with right now. We didn’t have a Hacker in the two Sprawl sessions I played. We’ll see. It may just take a little prep work. Our Friday f2f group just finished our Mutant: Year Zero campaign after 16 sessions. I loved it and the players clearly would have hung on for more sessions. But we’d gotten to a great point in the Ark’s arc. I wanted to stop while ahead. The awesome player epilogues made me certain about my choice and sad to see it end. Despite the session going a good hour later than usual, I made sure we picked the next game before we left. I’d had Urban Shadows when they last picked, so I brought that back. I’d also planned to present a collaborative world-building fantasy idea with anthropomorphic animals. But I couldn’t find the materials I’d assembled for that. Instead I subbed in Coriolis. The group had also discussed doing Mutant: GenLab Alpha, but I didn’t offer that. I’ll offer that next time; I didn’t want to do it right away after MYZ. The group chose Blades in the Dark (25 points) despite not having a copy of the book to look at. I printed the character and crew playbooks to hand around instead. Then it was Coriolis (17 points), Urban Shadows (16 points), and finally Base Raiders (12 points). Opinion and votes went across the board. While Base Raiders came in last, it got a couple of #2 picks. 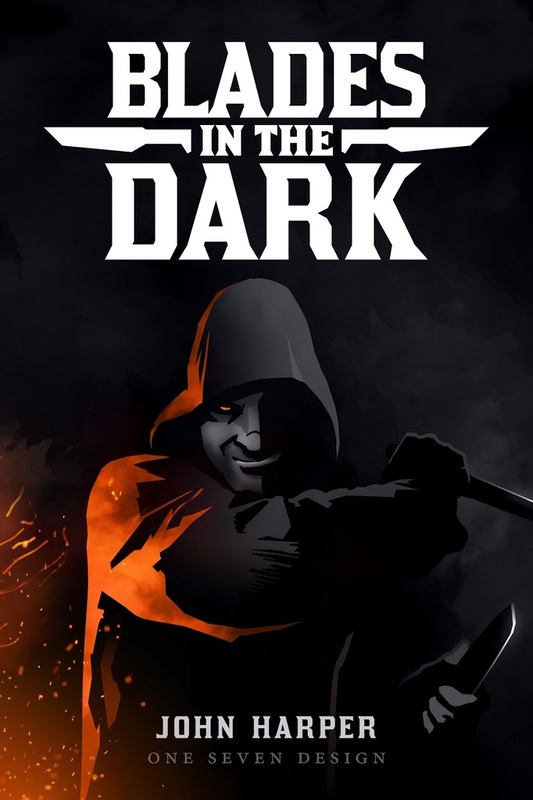 I’ve read through the Blades in the Dark pdf a couple of times now. It has a lot of moving pieces and some dense playbooks sheets. I hope playing it f2f will be easier than online. Five of the six players play Pathfinder, so I’m not too worried about complexity. I’m excited run this. 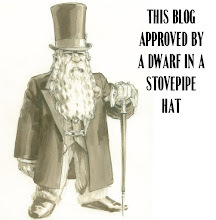 I love the concept and can’t wait to see it at the table. I briefly considered using a Planescape skin I read about on G+. But given the number of players and our unfamiliarity with the game, I’m sticking with the default set up. I had other games I seriously considered for these offerings. I only skipped 7th Sea because I’m still not sure how to solve the duelist imbalance problem. Maybe I will in the future. I strongly considered Cryptomancer, but I’d need a small, mystery-focused group for that. I looked using Dungeon World for a version of the Iron Kingdoms setting. Finally Dragon Age and 13th Age rounded out my shortlist. What do you have coming up? What are you considering for new campaigns?